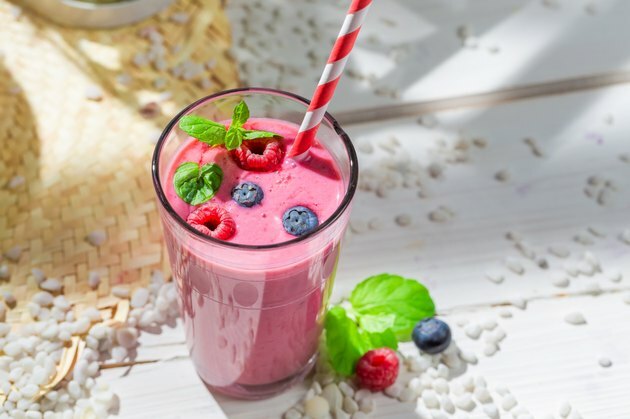 Protein shakes typically provide about 25 g of protein per serving, while the range of protein in meal replacements differs widely. Meal replacements intended for general health may be lower in protein, with 10 g per shake, while those intended for muscle building and dieting may contain up to 40 g. Protein provides muscle-building amino acids, but it may also aid in weight loss; a study from the October 2009 issue of "Nutrition, Metabolism and Cardiovascular Diseases" explains that high-protein diets may help you lose more weight and fat than lower protein meal plans. Protein shakes are typically low in fat, with 3 g or fewer, while the fat content in meal replacements varies. Meal replacements that are lower in carbohydrates tend to be higher in fat, and may be useful for low-carbohydrate diets. Higher carbohydrate shakes tend to be lower in fat. You may wish to find a meal replacement containing omega-3 fats, as research from the October 2010 edition of the "Journal of the International Society of Sports Nutrition" suggests it may aid in fat loss and muscle gain. How Many Calories Are in a Protein Shake?